Ryan Tannehill completed passes on the first four plays in his return from two serious injuries to his left knee, sparking a 40-yard drive that ended with a missed field goal in his only series, and the Miami Dolphins lost their exhibition opener to Tampa Bay 26-24 Thursday night. Winston is suspended for the first three games of the regular season for violating the NFL's personal conduct policy. 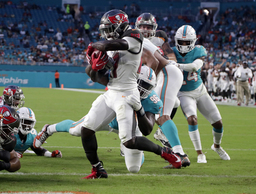 Miami's David Fales, battling Brock Osweiler for the backup QB job, led the second-string offense to a field goal against the Buccaneers' first-team defense. Fales also directed a 75-yard touchdown drive in the second quarter, and he finished 8 of 11 for 115 yards.